And here’s a post from Linda Anderson of Linda On The Go. She visited the Crying Room at Reading Cinema Rhodes. If you love going to the movies and have a bub or toddler in tow then you will love Crying Rooms! Reading Cinema Rhodes has two – they are essentially a little sound proof room positioned in a prime viewing area. You can see the main screen easily through the viewing window but nobody else can hear your little angel crying. 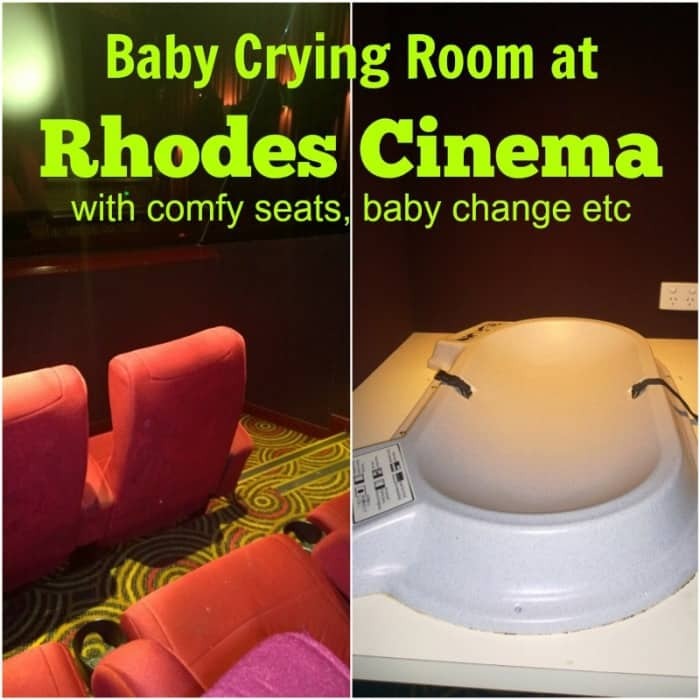 The Crying Room means you can go to any movie, at any time, on any day in that cinema which offers much more flexibility than weekly Mums & Bubs sessions you will find elsewhere. If you make a trip to Rhodes Reading Cinema be sure to leave enough time for a quick visit to IKEA too! Crying Rooms are located in the two largest cinemas which means you get to see the latest release movies. Each has nine seats, however avoid sitting in the front row as the seats are really low down and makes the screen harder to see. Strollers can be left in the front of the cinema. Most people will bring a baby in a baby carrier, capsule or even bring a little bouncer to put on the floor. You can’t see which movies are on in Cinema 4 and 5 by visiting the website but if you call the cinema you will reach a recorded message. Dial 4 for Crying Room session times. Baby change: There is a change table available in each Crying Room. It is has a dimmer light switch available to ensure you can change a nappy without disturbing other parents or blinding your baby with a bright light. Parking: Rhodes Waterside Shopping Centre has a large underground carpark. Reading Cinemas Rhodes’ ticket holders can enjoy FOUR HOURS of free parking seven days a week. What’s better, if you enter the carpark after 6pm, parking is unlimited and FREE! Hooray for all the Sydney cinemas that are baby, toddler and child-friendly. The parents of Sydney salute you? Have you visited a crying room? Linda’s also written a post about taking bubs to the movies, find it here. Now Mums are not restricted to just one session time a week and of course go to the movies with hubbie for a night out. Thanks Rebecca, much appreciated. How are you all going? Hope you’re well. Wow this is brilliant. I wish I knew about this about three weeks ago!!! A crying, fidgety, screaming baby was definitely not fun whilst I was eying to let Miss7 have a fun day out at the movies. Will definitely be going there next time we head to the movies. You can now see which movie timings are held in the halls with a crying room on the website, makes booking so much easier!